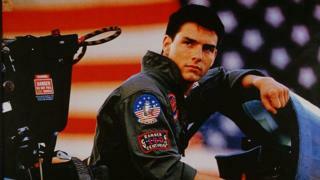 Top Gun: Maverick's release date has been delayed by a year because of "logistical reasons". Paramount had the date originally set for July 2019, but fans will now be waiting until June 2020 to see the film. The time will be used to work on film sequences using new technology and planes according to the studio. Filming began in May and was marked by Tom Cruise posting a promo picture on Twitter. He shared the photo of himself in US Navy pilot costume, showing he was once again playing Pete "Maverick" Mitchell, 32 years after the original Top Gun was released. More information has emerged in the last few weeks about who is part of the cast, with Mad Men's Jon Hamm and Westworld actor Ed Harris added to the list. In June it was confirmed Val Kilmer would be returning to reprise his role as fighter pilot Iceman. It is being directed by Joseph Kosinski, who also directed the Tron sequel in 2010. He told Collider in 2015, when the film was first announced, that it would be looking at modern-day warfare and how different the military world is now, compared with when the first film came out. "This world has not been explored," he said. "It is very much a world we live in today where it's drone technology, and fifth generation fighters are [...] what the United States Navy is calling the last man-made fighter that we're actually going to produce. "So it's really exploring the end of an era of dogfighting".